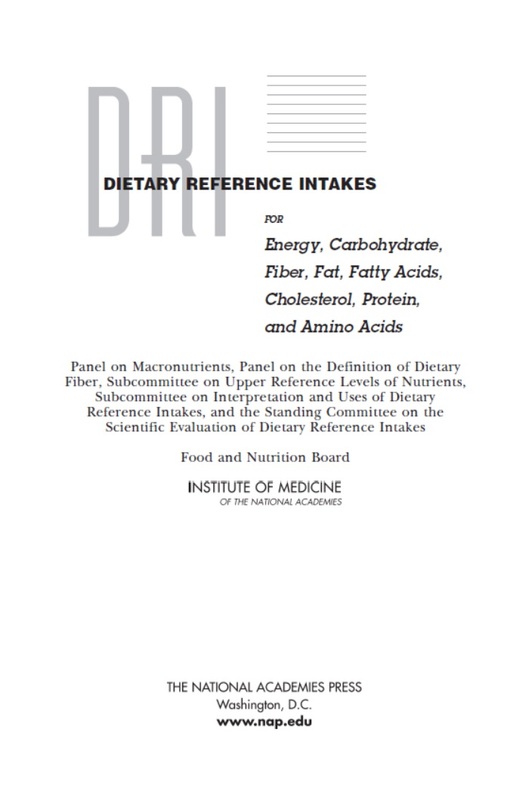 You can download Dietary Reference Intakes for Energy, Carbohydrate, Fiber, Fat, Fatty Acids, Cholesterol, Protein, and Amino Acids by National Academy of Sciences free in pdf format. Responding to the expansion of scientific knowledge about the roles of nutrients in human health, the Institute of Medicine has developed a new approach to establish Recommended Dietary Allowances (RDAs) and other nutrient reference values. 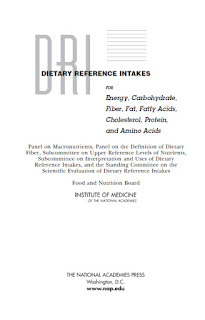 The new title for these values Dietary Reference Intakes (DRIs), is the inclusive name being given to this new approach. These are quantitative estimates of nutrient intakes applicable to healthy individuals in the United States and Canada. This new book is part of a series of books presenting dietary reference values for the intakes of nutrients. It establishes recommendations for energy, carbohydrate, fiber, fat, fatty acids, cholesterol, protein, and amino acids.